If you like the sound of vintage digital audio gear, you'll absolutely love the sound of chipcrusher. Filthy and useful! Superb emulations of vintage kit. Helpful oscilloscope. Negligible CPU hit. Per-module presets. Highly detailed control. Useful for sound design and mixing. Based in Montreal, Canada, Plogue are an audio software company with a history going back to the 90s. A few years ago, they unleashed the amazing chipsounds - a soft synth emulating the synthesis chips from 15 vintage computers and games consoles, including the Atari 2600, Commodore 64 and Nintendo NES. The latest fruit of their labours is chipcrusher, an effect plugin (VST/AU/RTAS) that emulates the signal path of a similar list of machines to those in chipsounds. chipcrusher's emulation starts with the DAC Encoding section, which essentially works as an advanced digital signal degrader, modeling the digital-to-analogue converters of various systems for crisp, crunchy or mushy lo-fi effects. You can dial in your own settings (including pre- gain, sampling rate, bit depth, filters and monotonicity) or choose from 16 presets, instantly calling up the sound of a C64 Digi, a Mac Plus or even an SP-1200 DAC. "If you fancy going even deeper, there are 11 Encoding codecs to choose from"
If you fancy going even deeper, there are 11 Encoding codecs to choose from, each with its own particular sonic qualities and all explained in gloriously geeky detail in the user manual. To be blunt, most of them sound the same in many contexts, but there are definite differences that will always be worth taking into account if you're after excruciatingly accurate chiptune authenticity. Perhaps the codec that stands out the most to us is the LPC-10, modelled on a Speak & Spell toy. With the sample rate set low, this can turn pretty much any input signal into a crazy growling, gargling noise of one sort or another. 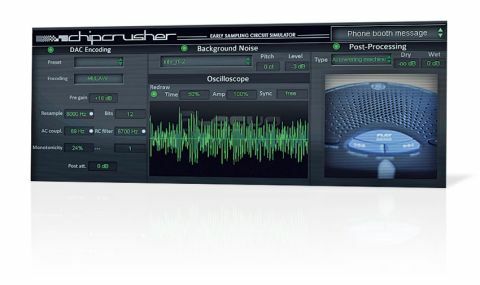 Let's be clear, though: the DAC Encoding module is the most comprehensive bitcrusher and sample rate reducer we've come across, and whatever type of sonic grit you're after, chipcrusher can deliver it. Next in the signal chain is the Background Noise module, which adds the noises emitted from the outputs of another long list of machines. "The Post-Processing module is actually the one that seals the deal for us"
Finally, the signal ends up at the Post-Processing module, which - despite the brilliance of the other two modules - is actually the one that seals the deal for us. It's based on a convolution engine drawing on a list of 50+ impulse responses, mostly covering the built-in speakers from the same machines that the DAC Encoder codecs are modeled on, but also including a few more quirky options, from iPod earphones to a vintage TV, a Stylophone and an old answering machine. This module includes separate Wet and Dry level controls for moderating the effect, and an informative picture of the currently selected device. Since its fundamental functionality is pretty simple and completely effective, it's difficult to fault chipcrusher. This is an outstanding processor for the price that always seems to produce, er, "high-quality lo-fi" with utterly convincing results. If you're a chiptune producer or a game/film sound designer, then chipcrusher is a must. Everyone else will find it to be a lethal weapon for mixing hip-hop, pop or electronic music, where eroded or vintage textures are often required.